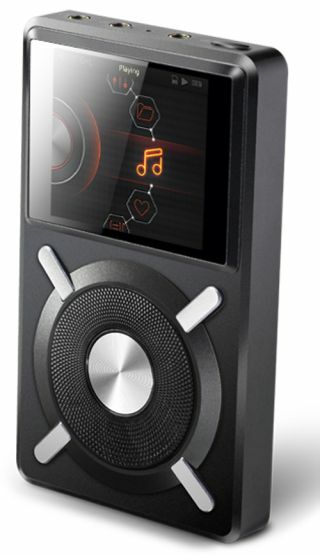 FiiO X5 hi-res portable music player also acts as a USB DAC | What Hi-Fi? Spotted at CES just before we left Las Vegas was the new FiiO X5 hi-res portable music player, joining the Astell & Kern AK240 and Sony NWZ-ZX1 we've already reported on. The FiiO X5 supports DSD, APE, FLAC, ALAC, WMA and WAV lossless music formats up to 24-bit/192KHz and uses the Ingenics 4760B dual-core 600MHz processor. Dual TF card slots give a storage capacity up to 128GB (2 x 64GB), and FiiO says there'll be support for twice that with future firmware upgrades. What's more, as well as being a hi-res portable music player, the X5 is also a USB DAC (digital-to-analogue converter) when connected to a computer. The asynchronous USB DAC also supports 24-bit/192KHz files. A ten-band graphic equaliser allows the user to tune the player's output to suit their needs, and a new mechnaical scroll wheel (like the one used on early iPods) gives control of the improved user interface. The device is fitted with a 2.4in colour LCD screen. Connectivity includes a standard line out, headphone out, coaxial digital output, USB 2.0 socket and the previously mentioned pair of card slots. The FiiO X5 weighs 122g and measures 11.4 x 6.7 x 1.6cm (HWD). UK price is to be confirmed.